The intersection of Soquel Drive and Chanticleer Avenue in Santa Cruz County is the site of a recently launched OWLtm viewer which provides interactive visualizations using augmented reality. 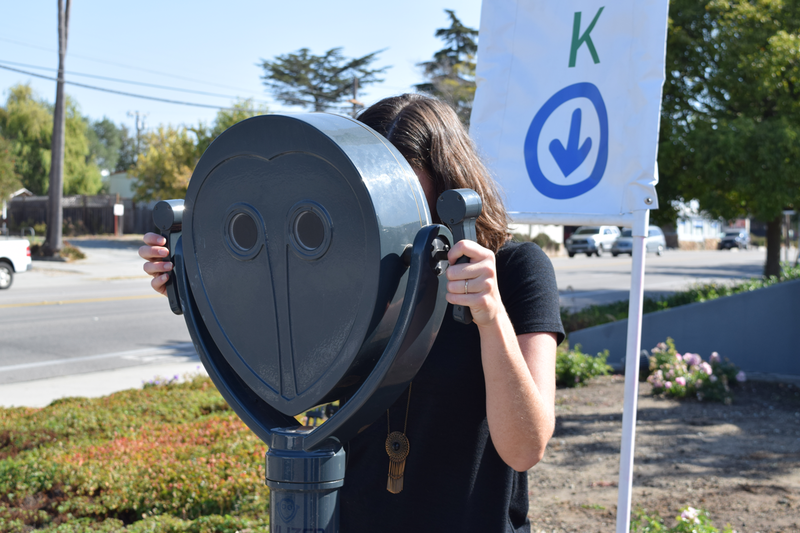 The first set of transportation and land use visuals are available now through November 15th using the on-site OWL at this location near Sutter Surgery Center and the Flea Market. The goal of the Visualizing Sustainable Transportation project is to create a fun and immersive experience for the community to view and provide feedback about potential future transportation options. The visualizations demonstrate how congestion, city and county plans/projects, the passage of Measure D, discussions about priorities with community leaders, and state mandates to reduce greenhouse gas emissions might be addressed in the short and long term via transportation and land uses. Participants are encouraged to visit the site and provide feedback directly on the viewer. Bus Rapid Transit Lite with transit priority at signals, queue jump lanes, and level boarding stations. The visualizations developed for Soquel Drive and Chanticleer are the first in a series. The first phase includes this site and one on the west side of Santa Cruz to be launched in the next few weeks. Next spring after Daylight Savings Time begins, another will be launched in Watsonville and possibly another mid-county location. In addition, a “pocket” viewer option will be available shortly that can be accessed via phones, tablets, computers and other electronic devices.